Due to its natural resources and location, Jubbaland has the potential to be one of Somalia’s richest regions, but conflict has kept it chronically unstable for over two decades. The regions of Jubbaland are not linked by road and have no history of shared administration. As an administrative unit, Jubbaland is not likely to be functional. The Somali constitution provides no clear guidance on how newly declared federal states are to be created, or what their relations with the central government should be. The environmental consequences of the charcoal trade are having a negative impact on livelihoods and food security. Evidence from neighbouring countries is that federalism and devolution, if not handled carefully, can exacerbate communal and political tensions over resources. There is concern among Somalis that their neighbours are not intervening in good faith. Ken Menkhaus noted the perception shared by the international community and by neighbouring countries that Jubbaland is an emerging federal state in Somalia. But, he asked, does Jubbaland have the key features, like those of Somaliland and Puntland, that would enable it to become a functional administrative unit? Jubbaland is not, he suggested, an ‘ethno-state’ like Puntland, because it is not populated by a single clan. Some view Jubbaland as a Darod clan state, but when the large number of non-Darod populations along the Jubba river and in east bank communities taken into account, the Darod clan probably comprise 50-60 per cent of the total population. He warned that, if Jubbaland is treated as a Darod state and power-sharing is institutionalized along those lines, then other residents of the region would feel disenfranchised and could turn to al-Shabaab. Is Jubbaland viable as a federal state? First, for Jubbaland to succeed as such a state, it needs some history of shared governance and cooperation—and it does not have such a history. Distant Jubbaland communities are very unlikely to respect claims of authority from Kismayo. A second criterion for judging whether a region could become a functional federal state is its economy and specifically its infrastructural links. Although the River Jubba appears to integrate the region vertically, its horizontal links to other regions are much stronger. The economies of Gedo region and Middle and Lower Jubba share little in common. Roads are impassable during the rainy season, making it difficult for people and goods to move between these regions. Menkhaus added that the term ‘Jubbaland’ came into common use 10-15 years ago, reflecting an aspiration for a regional polity in the trans-Jubba area. For the competing regional power-brokers, however, it has always been a code for Kismayo, the region’s main city, control of which was the true ambition. Menkhaus cautioned against thinking of Jubbaland as an administrative unit with authority centralized in Kismayo. Instead, it should be seen a series of municipalities with common systems of local governance. He stressed that insistence on Jubbaland as an overarching authoritative administrative unit would generate conflict. It could, however, serve as a viable source of regional representation at the central level. Degan Ali addressed the environment and specifically the charcoal trade, which has become a major political and economic issue in Jubbaland. The charcoal trade in southern and south central Somalia was once only a small part of the economy, supplying household fuel. The trade grew over time, especially after the fall of the Siyad Barre government in the early 1990s, when environmental controls collapsed. General Mohamed Farrah Aideed imposed a ban on the trade in the early 1990s, but his son, Hussein Aideed, failed to sustain this, giving rise to a large-scale expansion of the trade. Unlike in the north, where the charcoal trade still primarily supplies local demand, the Kismayo trade feeds the demand from the Middle East, essentially making it the new ‘black gold’ of the south. With a lack of income-generating alternatives and no governmental structures to enforce the ban, the trade has become the mainstay of the local informal economy in the south. Ali agreed with Menkhaus that Kismayo is a coveted prize, due to the revenue generated by the charcoal trade. It is estimated that US$ 25-50 million is earned annually by authorities who control the port from taxes on the trade. People, she added, do not understand the link between environmental degradation and food security. Land degradation contributes to an environmental crisis that has a significant impact on humanitarian outcomes in Somalia, particularly in the south and the Jubba regions. In addition to the charcoal trade, the exploitation of wildlife in Jubbaland is also a major problem. Jubbaland is among the few areas with wildlife in Somalia, primarily because of the Boni forest. On the Kenyan side of the border, the forest is protected but in Somalia it is a no-man’s-land with no regulations. Somalis, Ali added, have no control over the external causes of environmental change but they can control internal causes such as the charcoal trade. Communities think that the economic benefits outweigh the costs, because they only consider the short-term gains due to limited economic alternatives. Economic growth and environmental protection are hindered by the lack of proper infrastructure. Some parts of Jubbaland, such as Lower Jubba and Badade, are among the most isolated parts of Somalia and are completely cut off during the rainy season for three to six months. This increases the prices of goods and services, which the communities are unable afford. Another impediment to food security is the lack of investment the fishery sector. Ali’s organisation, Adeso (African Development Solut-ions), plans to conduct research on the impact of illegal fishing on Somali fishing communities. She noted that NATO forces are now guarding the Somali seas, but their presence is also causing fear among the fishing communities. Finally, Ali discussed the marginalization of communities who have been neglected in Jubbaland’s brokered agree-ments, namely the Bejuni, Boni and the various ‘Bantu’ groups. Their economic marginalization ari-ses from the low level of remittances from the diaspora and the consequent higher dependency on natural resources. It is these communities that bear the brunt of environmental degradation. Nikolai Hutchinson explained that Jubbaland does not exist in isolation from its neighbours. Kenyan border communities have strong interdependent relationships with communities in Gedo, as well as Middle and Lower Jubba. In periods of security trade routes, towns and settlements have proliferated. Pact, he said, supports cross-border communities to engage jointly in trade and to share access to services and rangelands during the dry season. Over the last 20 years, communities in Somali towns have experienced numerous administrations. Pact has had to sensitize them, including al-Shabaab, on the relationships between the border communities and the ways in which they support the livelihoods, security and resilience of communities inside Somalia. From a peace-building perspective, the aim has been to prevent security incidents, such as theft, turning into clan conflicts. While there are many grassroots opportunities to build upon, there have also been negative trends such as the recent spread of insecurity into Kenya. Kenyan elections and the devolution process have intensified political competition, creating new tensions. Ethiopian cross-border alliances have also had an impact on tensions between some Somali clans in the Gedo region. Most Somali communities in Jubbaland are more affected by local insecurity and the local economy, which need management, than by the Kismayo economy. The fragmentation of traditional clan structures, the proliferation of elders and the more recent co-opting of religious leaders have led to new insecurities and pressures on resources. Devolution and the emphasis on building stable administrative zones in Kenya, as in Ethiopia, is a positive opportunity but the large investment in natural resources brings rapid change that puts pressures on the communities. External Kenyan and Ethiopian factors have a big influence on communities in Somalia. For Hutchinson, the IGAD initiative is important because it tries to avert external pressures contributing to the creation of of parallel structures. But the initiative needs to be carefully coordinated and harmonized with the new Federal Government in Mogadishu. Matt Bryden noted that the discussion was timely, in light of the planned conference to determine the political direction of Jubbaland scheduled to begin the next day. Bryden noted that, regardless of the armed groups such as Al-Shabaab and Ras Kamboni, which have been fighting for control over Kismayo, the fundamental issues of equitable sharing, resource management and community perceptions remain unresolved. If not addressed, the region will remain the most contested in Somalia. The IGAD process was initiated in an attempt to unite various interests in Jubbaland, motivated by Ethiopian and Kenyan interests in cross-border security. Bryden agreed with Menkhaus that Kismayo is a microcosm of Jubbaland, whose interests are represented in the port city. These issues need to be addressed holistically, to ensure that Ethiopia and Kenya have secure borders. Both countries have in the past been aligned with different armed forces, so cooperation from the governments in Addis Ababa and Nairobi was necessary for any successful move into Kismayo. The stabilization strategy had been initiated in February, following the first meeting in May 2012, which agreed on a commitment to engage in a political process, a framework agenda and the representation and inclusivity of all groups in the process. During subsequent months, a draft charter for a Jubbaland administration was negotiated, which would be harmonized with the federal constitution. Other areas covered included technical consultations on security, reconciliation and resource management. Lastly, there were preparations for a conference to put the new administration into place. The new government, however, raised reservations about the process and issued counter-proposals. IGAD member states have since been in consultations on how to proceed. Nevertheless, the technical committee comprising of over 30 groups moved to Kismayo, without IGAD involvement, to continue preparing for the conference. 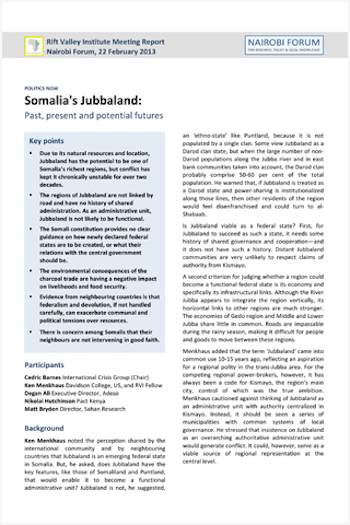 Bryden presented two scenarios on the potential future of Jubbaland. In the first, the process fails, due to the fact that this is a highly contested region. There are many interest groups involved and, with 500 delegates due to attend the conference, consensus will be hard to achieve. In this scenario, it is likely that the Federal Government will intervene and appoint the local leadership. This situation will necessitate agreement between the armed forces on the ground to support this approach and more time to implement it. In the second scenario, the process succeeds and there is a Jubbaland administration, which leads to a bifurcated outcome. What shall be the administration’s relationship with the Federal Government? On the one hand, it could be a positive relationship—as in Puntland—in which the two work together, negotiate on shared revenues and establish a security chain of command. On the other hand, the government could oppose the new administration, creating a difficult situation with some members of the Jubbaland communities being aligned with the government and parliament but at odds with the authorities in Jubbaland. Bryden concluded by saying that this is a critical time for Jubbaland: this issue is at the centre of the debate over whether federalism is the right way to move Somalia forward. Ken Menkhaus said it was unfortunate that Jubbaland’s rich resources are producing conflict instead of peace. When he worked with the United Nations Operation in Somalia (UNOSOM) in the early 1990s, he went to Afmadow, where he met some clan elders and asked them why they seemed to have given up the struggle for control of Kismayo. They responded: ‘We don’t need Kismayo, we’ve got Kenya.’ By then, the livestock economy of Afmadow had been reoriented towards the Kenya market. Menkhaus said it is a tragedy that Jubbaland has such high potential that cannot be utilized until the conflict is ended. Degan Ali responded to a question on whether the UN charcoal ban has had any effect. She pointed to the lack of government support when the president called for a ‘balanced approach’ and for acknowledgement of the resources that businessmen have invested in the trade. Ali said she was pessimistic about the government being committed to this ban because, when it comes to negotiations, the charcoal trade is the easiest issue on which to reach compromise, especially compared to wider question of political power sharing. On a question about land, Nikolai Hutchinson said that pastoralists and farmers in the region feel insecure about their land use, particularly in relation to other communities with more political and social capital. This issue has not been clearly addressed through federalism or devolution in Ethiopia or Kenya. In Somalia, it could easily contribute to further exclusions and the creation of local kingpins, as opposed to being an empowering process. Some of the lessons to be learnt include giving consideration to community interests through a decentralization of participation. Local inter-clan and inter-community participation, which include small policy agreements, helps to build confidence among people. Matt Bryden said that there were suspicions that Jubbaland’s neighbours were not intervening in good faith: that Kenya is interested in both a de facto annexation of part of Jubbaland and the control of Kismayo, while Ethiopia wants to export its own federalism to Somalia. Bryden thought that these suspicions are overblown, pointing out that, under IGAD’s auspices, there was active consultation between the governments. He concluded that it remains to be seen whether the process will continue to be inclusive—without the Ras Kamboni group, that currently control Kismayo, having too much say. The audience posed several additional questions: on the policy position of international actors dealing with the Jubbaland process; Jubbaland clan statistics; recommendations on dealing with the charcoal trade; whether Jubbaland is a test for the new Federal Government of President Hassan Sheikh Mohamud; especially if IGAD were to withdraw from the process; and the reasons for the absence of international actors in Gedo and other areas. Somali Bantu has become a collective name for diverse subsistence farming peoples who live along Somalia’s Jubba and Shabelle rivers, some of whom are descended from Bantu; Ken Menkhaus, ‘Bantu Ethnic Identity in Somalia’, Annales d’Ethiopie 19 (2003): 323-39.